Fifteen years ago I was with my friend Elza Smith on the longest motorcycle ride I have ever taken. We went over 8,500 miles from Houston to Vancouver and back via the Canadian Rockies and the Sturgis Motorcycle Rally. Three or four days into our ride we rolled into Grants. New Mexico, where the first Fire n' Ice Motorcycle Rally was underway. It was full of Bandidos, but seemed pretty peaceful. The 15th Fire n' Ice Rally was held about two months ago. It looks like it was the last one. Two days after the 2015 Rally concluded, Rally Chairman Manuel Vasquez stated that the Rally went as expected and that "...nothing major took place...minus some over-intoxicated individuals that had to be escorted out..." He further said that although about 150 Bandidos showed up, they never entered the entertainment tent and in general they were well behaved. Vasquez said he had spoken with all of the vendors, and they reported that they had made lots of money, and that although final numbers were not in, the Rally appeared to have been a financial success. The Mayor of Grants, its Police Chief and its City Council did not concur with any of this. The Chief of Police said that there is a spike in crime, including many fights, each year during the Rally. This year at one point there were 11 different fight calls happening simultaneously, and a police officer was injured while trying to break up a fight. The Chief said that on the Saturday of the Rally he saw at least 150 people carrying guns and over 60 on Sunday. Compounding the trouble, the Bandidos reportedly forced all other motorcycle club members to remove their Colors. One City Council Member said "We are asking for trouble. It's a numbers game. Eventually something will explode." Mayor Martin Hicks said "Every year the bikers come to town crime goes up...Bullets don't discriminate. I don't want that many guns here..." He said that the Rally had been on rocky financial footing for years, that he knows his town pretty well and that the folks who live in Grants were fed up with the Rally. Not everybody agrees. Most of the postings on the Rally's social media outlets support the Rally and the revenue it generates for Grants. Local newspaper accounts contained positive testimony from people who work in Grants. There were over 1,300 motel rooms booked. One woman made enough money during the Rally to buy her children's school supplies. Another woman used her earnings to get badly needed dental implants. On August 10, the City Council met and considered discontinuing support for the Rally. After a spirited debate, the Council voted 2-2 not to approve the Fire n' Ice Rally in 2016, and the Mayor cast the tie breaking vote against support. The Mayor suggests a Route 66 car show or some similar "family friendly" event to replace the Rally. This is a dicey situation. It could not have been much of a surprise to the Grants City Council that a bike rally likely would attract a rowdy element. They must have known that the Bandidos would be there, and that since New Mexico has an "open carry" law that allows the open carrying of firearms without a permit, many of the Bandidos would be armed. Nonetheless, other than a few fights and some drunkenness, there does not appear to have been much in the way of lawlessness. On the other hand, the Bandidos forcing "civilians" to remove their motorcycle vests must have been a cause for concern, especially considering the gun fight between the Bandidos and the Cossacks in Waco, Texas earlier this year in which several bikers were killed and many more were wounded. Grants is a pretty sleepy place, and other than going to Pat's Lounge, there is not much I can find to do there. There are a bunch of Route 66 era motels, but since they either are closed or in a beat up condition, I usually stay at the Holiday Inn or the Red Lion (which is the only motel in town with its own bar and restaurant). So, I've got to think that the Fire n' Ice Rally was a significant revenue source for the community. That revenue source now is lost. Hopefully Grants will find a financially successful alternative. 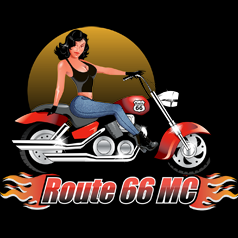 Sam Allen wrote T_he Motorcycle Party Guide to Route 66._ He also created and operates www.route66mc.com, which is the most comprehensive single source of information about Route 66 available on the web.